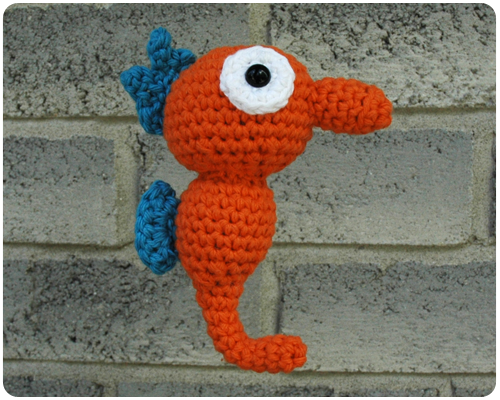 One day a crochet jellyfish and dolphin were swimming along when they met a seahorse. I found the pattern for this little friend online (pattern available here). To make him I used the last bit of Orange Chill yarn that I had in my bin, well there is a wee bit leftover for a bird beak or some other detailing if I need it, but other than that it is gone. I honestly never thought I would see the day; there is a lot of yarn on those big balls of Bernat Handicrafter Cotton and when you buy one, you are really committing to the color. Like I have said before, crocheting toys is addictive. In the last month I have made an owl, a frog, a jellyfish, a dolphin, and now a seahorse. And I still have a few toys that I want to make. Watch this space for more crocheted toys to make their debut. This little guy is so cute! To be honest, I wouldn't have looked twice at the original pattern. The colors that you chose are just perfect. Can't wait to see more of other toys! Thanks Karen. He looks so cheerful and happy, doesn't he? Thanks so much for reading and commenting. Camilia, thank you so much for your very enthusiastic comment. Have fun learning to crochet and knit...so fun! Thanks for reading. Jennifer, thank you for letting me know about your linky party...I have gone right over there and linked up a few of my creations. Thanks for stopping by.